Skin is something very difficult to hide from the world, and while our initial reasoning for maintaining skin health might be due to vanity - skin is our largest organ that protects our internal body from the external environment. Aside from being one of the most influential factors in our perceived sense of beauty, skin is important for regulating body temperature, wound healing, immune response, and even blood pressure control. Nutrition is a critical component in maintaining skin health. The effect of dietary deficiencies, nutrition supplements, and certain dietary restrictions on overall skin health have been frequently explored. Nutritional deficiencies are often observed first as skin problems (1). One symptom of pellagra, a niacin deficiency, causes scaly skin sores (2). Vitamin B12 deficiencies can be observed as hyperpigmentation problems, or skin discolorations (3). Another symptom of the vitamin C deficiency, scurvy, can result in skin hemorrhages (4). Malnutrition negatively affects skin health when both severely under-nourished as well as when excessive food consumption occurs. Obesity can affect skin health by disrupting and or changing hormone levels, oil production, vascular circulation and collagen turnover (1). Some nutrients have created buzz for their skin-improving and protecting qualities. Diets high in vegetables, legumes, and olive oil have been found beneficial in protecting the skin from damage because of the antioxidants, vitamins, and healthy fats found in these foods. 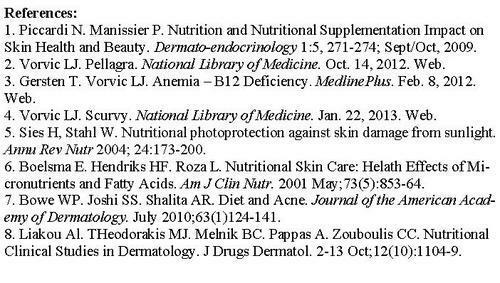 Increased consumption of vitamin C and omega-3 fats in combination with reduced saturated fat and carbohydrate intake (as mentioned in The Slice Plan) are associated with improved skin appearance and resiliency (1). Vitamins, especially carotenoids (vitamin A), and polyunsaturated fatty acid supplementation, such as oils from fish and flaxseed, hold promise for optimizing skin health. While not a substitute for topically-applied sunscreen in defending skin damage from UV rays, consumption of these nutrients may protect the skin from UV light damage (1, 5). Dietary intake of fish oils and plant sources of polyunsaturated fats may boost cell-mediated immunity - especially for the elderly through reducing inflammation in the skin (1, 6). Omega-3 fatty acids, antioxidants, zinc, vitamin A, and dietary fiber are all apparent components in skin health; however further research is still needed to clarify the relationships and mechanisms involved in skin hydration status, oil production, thickness, firmness, and elasticity (6-7). Remember that correlations found by research do not equal direct causation. Many other aspects affect skin health such as environmental factors (pollution, sun exposure, etc.) and genetic dispositions. However, a healthy diet rich in vitamins, minerals, and antioxidants can go a long way in providing your skin with what it needs to do its job at keeping you healthy and keeping you beautiful! Good nutrition alone can't cure skin problems so if you suffer from acne, hyperpigmentation, or other issues, you should still consult a dermatologist to maintain optimal skin health.